Good location, close to wonderful beach, beautiful view to sea, full relaxations. Located just by the ocean. Some nice restaurants nearby. Great location as advertised; right on sea really; but it's cold there ! Especially higher up. Very cold in morning. Appt very basic indeed (we had middle of the 3 available); no cleaning offered in 10days. Only offered very basic supplies (minimal toilet paper etc). Bathroom very mediocre and small with flimsy door. Hot water very variable due to East facing solar panels and cylinders not big enough. Great location for bread shop (300 yds) and 4 top-class restaurants as well as many others in easy walking distance. Parking fair - sometimes have to drive around to find space. 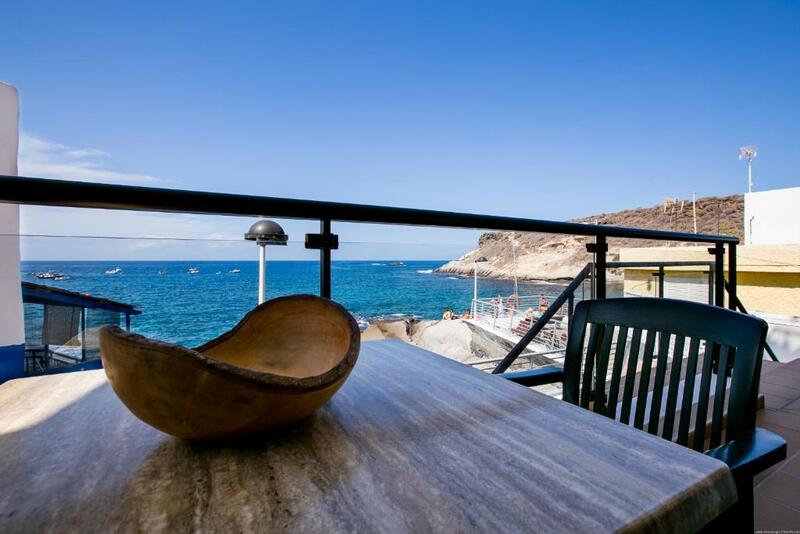 The fantastic location overlooking the crashing waves of the sea. Right at the sea. No sand beach but great for swimmers and snorklers. I Liked the proximity to the Top Training Sports Centre as well as the shops and restaurants. It was also a great place to watch the sunset, and have a swim in the warm sea. Any issues were dealt with promptly without any hassle. The view over the sea is brilliant even at night with the moonlight glistening over the water. We totally loved the sea views and the sounds of the sea all day long. We loved the closeness to the ocean and that you could be in there swimming in a minute from your apartment. Everything you needed to cater for your needs was there. The complimentary wine was a really nice touch after a long journey to relax with. 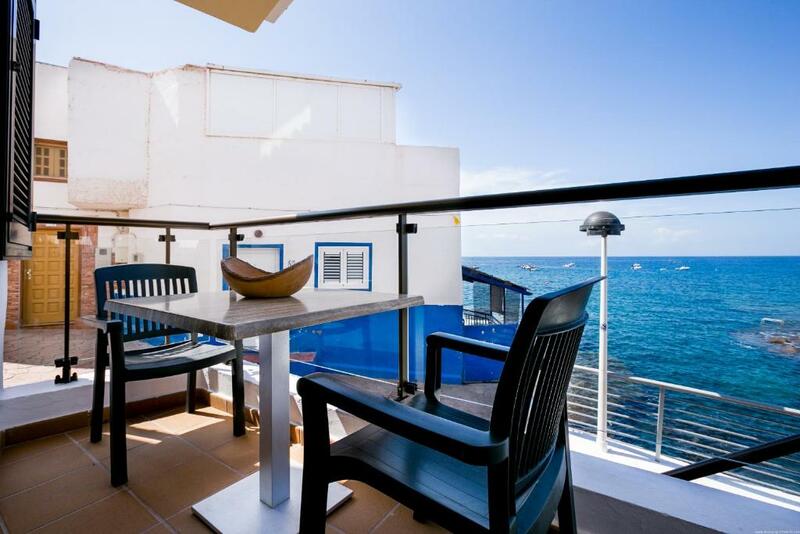 Lock in a great price for Apartments La Caleta Sunrises – rated 8.8 by recent guests! 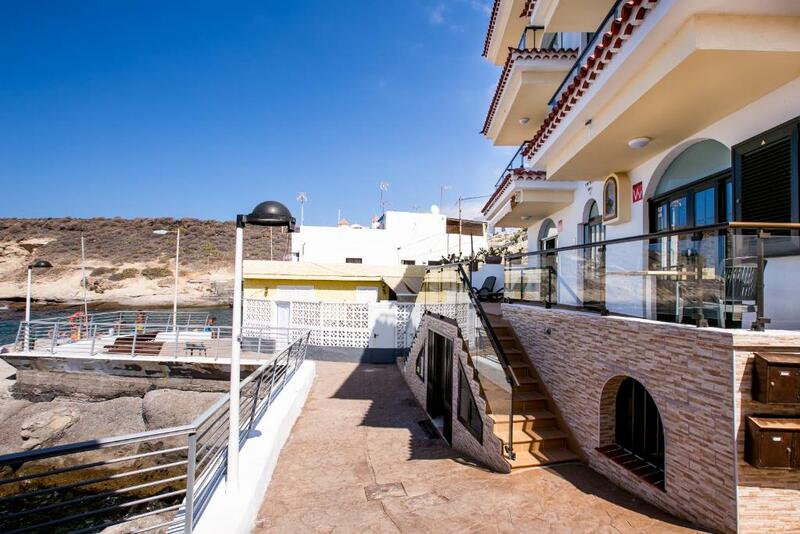 Located within 3.3 miles of Aqualand and 2 miles of Plaza del Duque Shopping Center in Adeje, Apartments La Caleta Sunrises has accommodations with a kitchen. Complimentary WiFi is provided. Providing a balcony, specific units are air-conditioned and have a dining area and a seating area with a flat-screen TV. 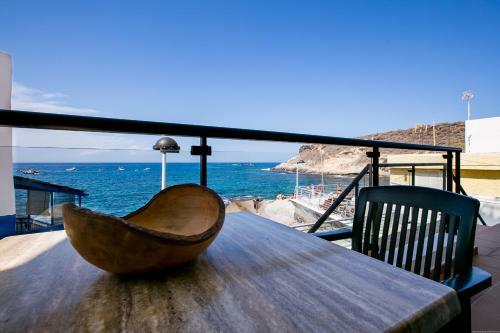 A patio with sea views is offered in all units. 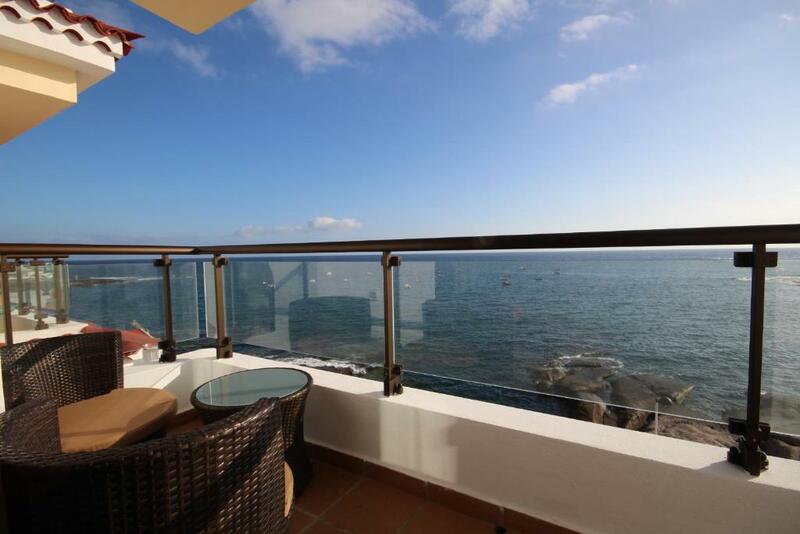 Gran Sur Shopping Centre is 2.7 miles from Apartments La Caleta Sunrises, while La Pinta Beach is 3.6 miles from the property. Tenerife Sur Airport is 14 miles away. When would you like to stay at Apartments La Caleta Sunrises? 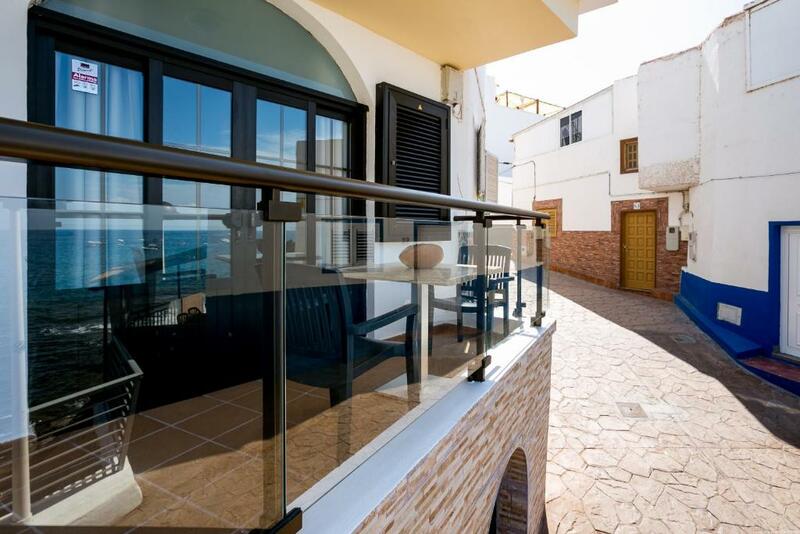 Featuring a furnished terrace with sea view, this air-conditioned apartment has 1 double bedroom, 1 twin bedroom and 2 bathrooms. The open-plan kitchen is equipped with a dishwasher, microwave and toaster, while the living area comes with a sofa, TV and dining table. 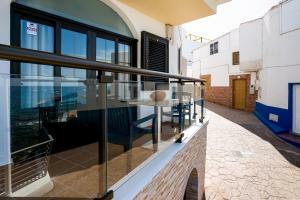 Featuring a furnished terrace with sea view, this apartment has 1 double bedroom, 1 twin bedroom and 1 bathroom. The open-plan kitchen is equipped with an oven, microwave and toaster, while the living area comes with a TV, sofa and dining table. 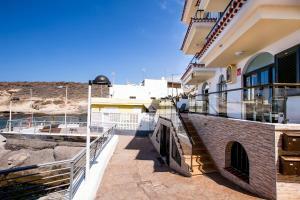 House Rules Apartments La Caleta Sunrises takes special requests – add in the next step! A EUR150 damage deposit is required on arrival (around USD168.82). This deposit will be fully refunded at check-out, as long as there isn't any damage to the property. 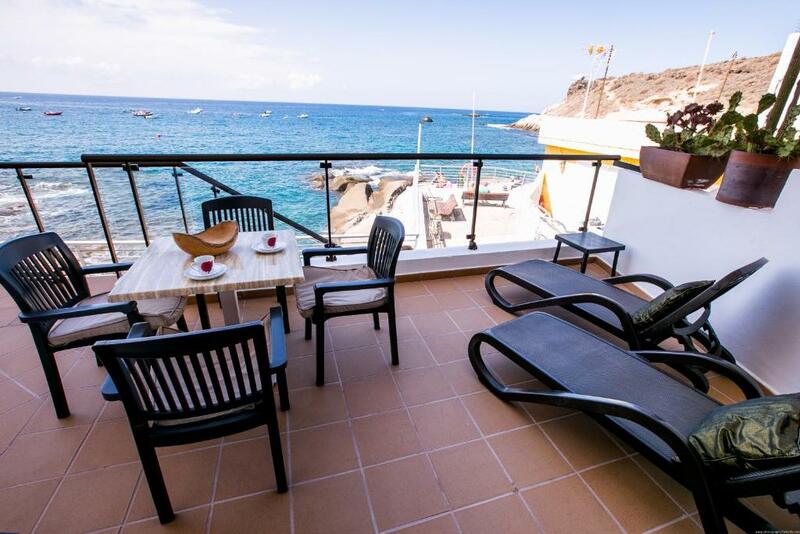 Apartments La Caleta Sunrises accepts these cards and reserves the right to temporarily hold an amount prior to arrival. A damage deposit of EUR 150 is required on arrival. That's about 168.82USD. This will be collected by credit card. You should be reimbursed on check-out. Your deposit will be refunded in full by credit card, subject to an inspection of the property. 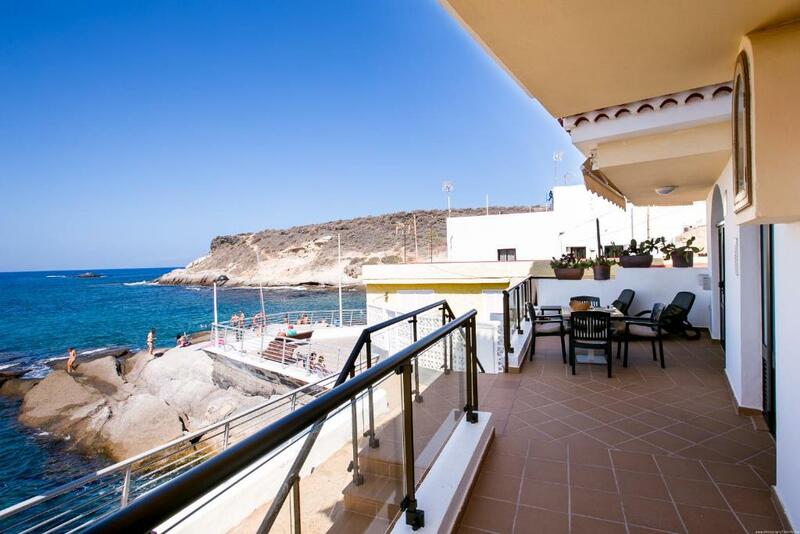 Please inform Apartments La Caleta Sunrises of your expected arrival time in advance. You can use the Special Requests box when booking, or contact the property directly using the contact details in your confirmation. Great location as advertised; right on sea really; but it's cold there ! Especially higher up. Very cold in morning. Appt very basic indeed (we had middle of the 3 available); no cleaning offered in 10days. Bathroom very mediocre with flimsy door. Hot water very variable due to East facing solar panels and cylinders not big enough. Great location for bread shop (300 yds) and 4 top-class restaurants as well as many others in easy walking distance. Parking fair - sometimes have to drive around to find space. The kitchen was infested with ants, we had to keep the bread in the microwave. they were living behind the the kitchen units. It would be impossible to keep any food in the cupboards. The sofa was not very comfy and only sat three next to each other, felt a bit like being in a train carriage! To stretch out and relax we had to use a bed. Beds ok but needed more pillows than one each. Neither hairdryer worked properly - one terribly hot, the other low power. Scared to use washing machine as it sounded like it had a brick going round in it when we tried to rinse some beach towels! Lots of tiny little crawling insects in kitchen and first bathroom. None of this ruined the holiday but not sure we would stay again - very sad as the location is amazing. On a couple of occasions, the hot water ran out. Availability of hot water was an issue. Probably the boler was underdimensioned. Parking isn't great but there is always something on the streets nearby. It was warm at night despite it being end of October. An air conditioning unit would be a great investment as not only would it provide comfort, but security as you can sleep with the doors and windows shut. Darius co0llected us from the airport and was not very friendly . The toilet paper situation takes a little getting used to but I know that this isn’t your fault. I didn’t like the smoking on the balcony next door as the smell came into our room as we had the patio doors always open when we were in the room. It could have been a bit more clean. You have to pay for extra towels. The coffee maker should be changed. * There was construction every single weekday of our stay. We did not expect to be woken up by the sound of hammering, drilling, yelling of the workers and overall construction-related sounds. * One of the main things that was highlighted when the property was booked was how important safety was. This was not the case since the construction workers were coming in and out of the building at their leisure and left the two main doors open at all times. * The wifi signal can only be obtained in the living room. Signal in the kitchen is very very poor and there is zero wifi signal in the balcony, bathroom and bedrooms. * The steam and odors accumulate in the bathroom because the bathroom window cannot be kept opened because it faces the building staircase, so anyone who is using the stairs can quite easily look inside the bathroom. * The kitchen sink was clogged and the water takes a long time to go down the drain in the shower. * The light bulb in the bedrooms worked intermittently. Some days it turned on while other days we did not have light. * The heater kept leaking and there was actually a puddle of water in the bedroom. * One of the chair legs was loose. Me and my family were incredibly disappointing of the quality of the host and the apartment since the pictures really did not do justice to what we received. I must mention that the "super" lives in the building, so he was able to fix the drain in the bathroom and the kitchen. A few more utensils in kitchen could have been useful and shower head wouldn't stay on holder.